If everyone can stay truly healthy, this offense is going to be top ten again. A lot of these names have battled injuries that lingered, making them drop in production. Coming into the season full health, Jose Altuve and Carlos Correa should bounce back. Alex Bregman brings everything you could possibly ask for in a ballplayer. This front four with George Springer is very dangerous. Adding Michael Brantley in the offseason is going to give them an above average left-handed bat in the outfield. They will continue with Gurriel, Tyler White, and Josh Reddick to round things out. Houston also added Robinson Chirinos, who has some pop against left-handed pitching. He will maintain a full time role with Brian McCann now in Atlanta. Houston should bounce back to performing like we know they can. Houston had one of the most dangerous rotations in baseball last year, but 2019 will be a little bit different given some changes. The Astros finished with the best ERA in baseball last season, and it started at the top with Justin Verlander and Gerrit Cole. Both threw over 200 innings last season, and had over 250 strikeouts with a sub three ERA. Verlander has crushed in Houston, and this is certainly a team where arms go to change for the better. His strikeouts have been up since moving from Detroit, and Cole took a massive step forward in his career. He was already above average in Pittsburgh, but the strikeouts have really lifted him into the next level of arms. Cole had 276 strikeouts last season, and year two is going to be interesting because of recency bias. Verlander and Cole are both projected for well over 200 strikeouts again. What is changing in Houston is the names following after Cole and Verlander. Charlie Morton is now in Tampa Bay, Lance McCullers is going to miss the 2019 season, while Dallas Keuchel is a free agent unlikely to return to Houston. Joshua James is a 25-year-old right-hander who was a late round draft pick that thrived in the minors last season. He earned a few starts with Houston, and looked very impressive. James averaged about 97 mph on his fastball, and had a very good changeup to go with it. We have a limited sample size on James right now, but projections have him pitching over 100 innings this season. 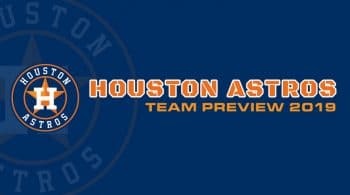 Collin McHugh and Brad Peacock are likely going to be re-joining the rotation, and they were in the bullpen last season. Peacock was another name who turned around his career in Houston. In 2017 he made 21 starts, going 13-2 with a 3.00 ERA. Peacock has hit career highs in each of the last three seasons, continuously raising it. Peacock won’t have over a 35% strikeout rate this year if he isn’t pitching out of the bullpen, but is a quality arm at the backend of a rotation. McHugh pitched out of the pen last season, with a 1.99 ERA and 33.2% strikeout rate. Even falling back to half that production with his career would be huge for a fourth or fifth starter on Houston.